When you get into really serious Windows development, you may well need to create NT service applications. Borland's input is half-hearted: Delphi includes support for NT service application writing, but as you work with this framework, you'll soon discover its less-polished parts! In the TDM #69 I reviewed SvCom, "an integrated package of classes and tools for development of service applications and use of NT Security framework." (as the current SvCom web page states). Good stuff, I'm still using it for service development. 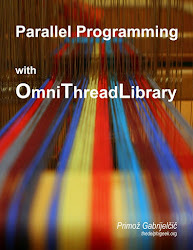 Every serious Windows programmer who has developed at least one multi-threaded application knows about thread synchronisation. You know what I mean: critical sections, mutexes, semaphores, signals and so on. ... But to write truly distributed applications, running on different computers, we need new tools. The plan was to make most of them work on Linux as well, but as I discovered in File Sharing on Linux (not yet published on my blog), but as I found later, this was nearly impossible to do as Linux implements file locking in completely different way. I never used those primitives much as TCP/IP communication became much more prominent in later years. Still, they can be very useful if you want to quickly put together a multi-computer demo or quick and dirty solution. The GpFileSync unit never made it to my web so I'm linking to the current version at the bottom of this article. Anyway, I fixed the problems in the abovementioned code and during that process I found out that there is almost no support for time zones built in Delphi and that Windows APIs on that area are really not that simple to use. So I built a time zone manipulation library that handles time zone information access and time zone conversions with daylight savings time support. This GpTimezone unit is still alive and I'm using it regularly - mostly the NowUTC function. The article also dealt with the (now happily forgotten) Swatch Time. Also included was a neat utility (if I'm allowed to say so) for timezone conversions, which I'm still using today without any changes to the original code. Fredrik Loftheim made an interesting observation to my previous article on TWinControl.Controls enumerator - namely that the enumerator factory doesn't have to be interface based. It can be replaced by a record. Source is almost the same as before, but we can skip the interface declaration. Generated code is simpler as the enumerator factory is simply allocated from the stack and automatically destroyed when it goes out of scope. No interface support and no reference counting is required. Simpler and faster, that's the way to go. The new version of the TWinControl.Controls enumerator plus some other stuff is available at http://gp.17slon.com/gp/files/gpvcl.zip. I found it interesting that Borland built a Components enumerator in the VCL, but not a Controls enumerator. The EnumControls interface is simple. It takes a starting point for enumeration and an optional class filter. By specifying the latter, you tell the enumerator that you're only interested in child controls of a specified class. As it is used in a for..in loop, EnumControl must return a class or interface that implements GetEnumerator function and that is exactly what it does. GetEnumerator, on the other hand, creates an instance of the TControlEnumerator class, which implements the actual enumeration. On the implementation side, EnumControls creates an instance of the TControlEnumeratorFactory class, which implements the IControlEnumeratorFactory interface. TControlEnumeratorFactory just stores parent and matchClass parameters for later use in the GetEnumerator function. GetEnumerator creates an instance of the TControlEnumerator class, which implements the actual enumeration in a pretty standard manner. Only the MoveNext method is slightly more complicated than usual because it must optionally check the matchClass parameter. It's instructive to see how all those parts play together when the code fragment from the beginning of this blog entry is executed. EnumControls is called. It creates an instance of the IControlEnumeratorFactory. TControlEnumeratorFactory constructor stores parent and matchClass parameters into internal fields. TControlEnumeratorFactory.GetEnumerator is called. It creates an instance of the TControlEnumerator and passes it internal copies of parent and matchClass parameters. TControlEnumerator's MoveNext and Current are used to enumerate over the parent's child controls. For..in loop terminates and compiler automatically destroys the object, created by the GetEnumerator method. Sometime later, the method containing this for..in loop terminates and compiler automatically frees the IControlEnumeratorFactory instance created in first step. The TWinControl.Controls enumerator plus some other stuff is available at http://gp.17slon.com/gp/files/gpvcl.zip.